A Merrill Lynch study found that 80 percent of today’s retirees say health is the most important ingredient for a happy retirement. Sure, having enough money to enjoy retirement is important. That can be an issue if you have lots of healthcare costs. A Fidelity study says that retired couples should plan to spend $260,000 in out of pocket health-care outlays, up from $220,000 in 2014. Long-term care could add another $130,000. Staying healthy helps mitigates those costs. Here are five tips to feeling well and having a strong quality of life during your retirement years. Despite the sore muscles and aching joints, working out is critical to your physical and mental wellness. It helps prevent illness, makes your bones stronger and puts you in a better mood. 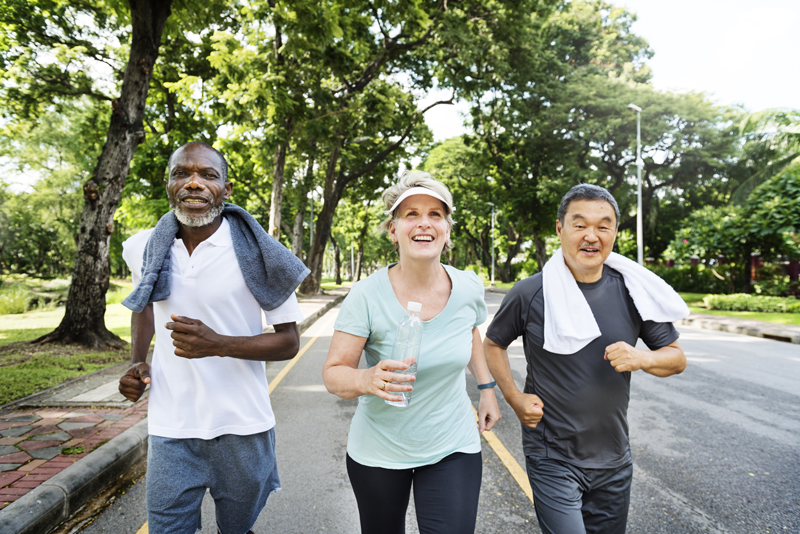 The Center for Disease Control recommends that adults 65 or older should get more than 75 minutes total of moderate exercise each week. That includes walking or some type of aerobics (or dance) class. Also, you should do some sort of muscle training twice a week. Before you begin any exercise program, please consult your doctor. Also, engage a friend to workout with you and to provide inspiration and support. With the kids grown and gone, it seems silly to cook a big meal for one or two of you. It’s easier to snack on chips or eat breakfast and dinner out. It’s easy to forget the healthy stuff. Poor nutrition is a significant issue among seniors. According to the National Council on Aging, malnutrition increases your risk for serious health problems, including making it harder to recover from surgery and disease; and increasing your risk for infection. Good nutrition fuels your body, even as you age. It might be helpful to meet with a nutritionist to help you plan your meals. Now that you have more time to spend with friends, you might find yourself sipping too many cocktails in the afternoon or at dinner. Alcohol impacts many of your body’s systems – including the brain and liver. One nice glass of red wine actually helps your heart. Six glasses do not. Consuming large amounts of alcohol – at any age, but especially as an older adult – can negatively impact your health. One or two drinks a day (5 ounces of wine, 12 ounces of beer or 2 ounces of distilled spirits) should be your limit. Don’t wait until something hurts or you just don’t feel right before seeing a doctor. You should find yourself a respected health practitioner (especially one who specializes in elder care) and make regular appointments (maybe once or twice a year). Get your cholesterol and blood sugar levels checked. Take advantage of free health screenings offered in many communities. And don’t forget your flu and pneumonia vaccines. Life’s events and aging can cause wear and tear on your emotions. You probably have lost family members and friends. A health incident (fall or illness) can keep you from engaging in your favorite social activities. Research continues to draw a direct line between stress and depression and health issues. Having a positive outlook and a sense of purpose can help keep you happy and healthy. Avoid getting lonely. Stay active in an organization or volunteer. Make regular plans to visit family and friends. Though a little expensive, a plane ticket to visit another part of the country can be great medicine. Build a support system of family and friends; and do a little research on how to keep healthy. The National Institute on Aging has an excellent website on staying health in your senior years.